AMC Glass Company, Inc. specializes in quality Residential, Commercial, Auto and Industrial glazing services to the Silicon Valley and throughout Northern California area for over 24 years. We are one of the largest Glass dealerships in Northern California. 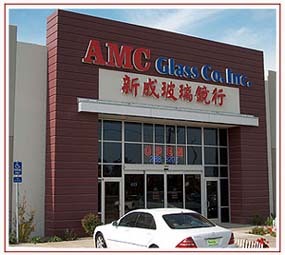 AMC Glass Company, Inc. strives to offer the best customer services. We believe that "Our Customers Are Our Business", that's why all of our experienced employees are dedicated to prompt and courteous customer service. You can rest assured that you're getting the highest quality service at the best prices in town. We welcome developers, contractors & home owner's to bring your specs to us for estimating. We will bid on all projects big or small. We are not your normal glass company, we provide an array of quality products and services. From, large scale commercial projects, mixed used residential-retail projects, and residential projects to home owners residential remodel projects. We are also proud to offer our customers the selections of several choices of quality branded Aluminum & Vinyl windows and doors such as CertainTeed Windows, Fleetwood Windows & Doors, IWC, Milgard Windows, MI Windows & Doors to name a few. Whether you're looking for a window contractor to upgrade your existing windows or just want to purchase the windows and install them yourself, you found the right place, but that's not all we have to offer. We also carry a selection of Shower Doors, Closet Doors, Skylights, Fiberglass Entry Doors, and Wood Doors. Need glass or mirror in a hurry? in most instances we can cut to your specs while you wait on stock glass. We carry a wide range or Mirror, Clear Annealed, Bronze Glass, Grey Glass, Obscure Glass in stock. Tempered glass usually requires a 2-3 day lead time.